When young children want something they cannot have, want to do something they cannot do or just feel bad and do not know how to feel better, they may get frustrated. This feeling of frustration can become anger. Young children do not have much experience handling strong emotions, such as anger. They may yell and cry. They may even throw things or fall on the floor and kick. This behavior is often labelled a tantrum. Many children have tantrums. It is their way of expressing their anger; it is normal behavior for children under 4 years of age. Babies often cry when they are uncomfortable or need something. It is good for parents to respond promptly and consistently to their cries, and to give them what they need. However, as babies grow into toddlers, they need to start learning how to take care of some of their own needs. They also need to begin learning how to manage their own frustrations and emotions, including anger. The parent-child relationship and the overall emotional feeling within the home and family are very important as children learn to explore, understand and manage emotions. Children can have difficulty regulating their emotions when parents are harsh, controlling or give in too easily. Children need a warm, supportive environment as they begin to understand their own emotions, as well as the emotions of others. 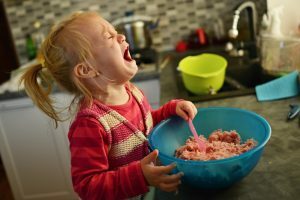 Setting clear limits can help children express their emotions in socially acceptable ways and increase feelings of emotional safety and comfort. It also is important to provide children with clear instructions and limits for when they do get angry, like “please use kind words, no yelling” or “hands are for hugging, not hitting.” These or other guidelines can help them know what to expect when it comes to expressing emotion in the home. Parents who coach their children on emotions – by inviting them to problem solve, label emotions and encouraging self-soothing and self-regulation – aid in the development of children’s successful emotion management. The opposite is true of parents who dismiss their children’s emotions – by ignoring, putting down or punishing children for expressing emotions. It can be very helpful to let children know that you realize they are upset; acknowledging children’s feelings goes a long way in helping them learn how to recognize and deal with anger. 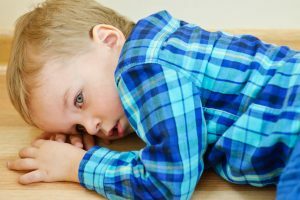 To help children deal with, and recover from, negative emotions, parents can use strategies such as distracting (e.g., shifting attention away from what is causing the emotion), comforting (e.g., physical affection, positive speaking) and reframing (e.g., changing how the situation is interpreted so it is no longer viewed negatively. For example, “Your team may have lost the soccer game, but you sure had a lot of fun and got some good exercise”). Frustration: Children get frustrated a lot. Toddlers are not yet familiar with better ways to express frustration, like using words, for example. Often, the emotions they feel are felt very strongly and their lack of emotional experience can cause them to lose control and become angry. Lack of independence: There is very little in children’s lives that they actually control. They may have no routine during the day or there may be a change in their routine; their mother and their father may fight, be mad, be sad or act differently; or their mother may be busy with a new baby or an older child who requires her attention. This lack of control and consistency can be very difficult for young children. Being tired, hungry or bored: Children, like most people, are more vulnerable to frustration and anger when they are tired, hungry or simply in need of positive attention or interaction from their caregiver(s). Let your child know what is coming next. For example, “After we clean up the toys, we are going to take a bath.” Using a timer is also a great way to help your child transition between activities. Avoid scheduling activities that take place during your child’s nap or bedtime. Consider whether or not your child can manage your plan for the day. For example, can my child handle going on one more errand? Remove items that are tempting to your child before they see them. Use simple rules that your child can understand and follow. Stay calm. It helps the out-of-control child to see you in control. If you get angry, your child will learn to do the same thing. Stay calm and think about what is happening. • Talk gently. Stay close and talk “low and slow.” Be soothing and understanding. You can say, “It’s OK. I know. You will be all right. I am here”, to empathize with your child’s feelings. • Hold them gently (while talking gently). Hold them with gentle arms until they are quiet. Although, some children need space to work out their feelings with their bodies, others feel safe when held. Do not give children what they want to get them to stop yelling and screaming. They will learn to have a tantrum to get their way. Wait until they have finished or help them calm down. Give a choice and a consequence. Sometimes you may be in a situation where you cannot let a tantrum happen, like at a family event. In this case, give your child a choice. For example, “Either take some deep breaths and calm down, or you can scream in your room.” Clear, simple and constant limits help the child know that someone is there to support him or her, even when they are having a difficult moment. Many children have tantrums. It is their way of expressing their anger. However, sometimes it can also become a tool for getting what they want. Parents should avoid sending the message to their children that it is okay for them to use their temper and violence to get what they want. They need to be taught a better way to handle their problems and disappointments. Children learn more from our actions than from our words. So, to teach your child to solve problems without violence, you need to set a good example. This means managing your own anger without violence. It means using non-violent discipline skills with your child. And it means teaching your child ways to manage anger in positive ways instead of having a tantrum. These are not easy lessons to learn, especially for young children. So be patient. This is the time to begin teaching your child to manage emotions and solve problems. It can take time, but it can certainly be done. Brazelton, T. B., & Sparrow, J. B. (2006). Touchpoints. Reading, MA: Perseus Books. Eisenberg, A., Murkoff, H. E. & Hathaway, S. E. (2009). What to expect in the toddler years. NY: Workman Publishing. Gottman, J. M., & DeClaire, J. (1997). Raising an emotionally intelligent child: The heart of parenting. New York, NY: Simon & Schuster. Lieberman, A. F. (1993). The emotional life of the toddler. NY: Free Press. Morris, A. S., Cui, L. & Steinberg, L. (2013). Parenting research and themes: What we have learned and where to go next. In R. E. Larzelere, A. S. Morris, & A. W. Harrist (Eds.) Authoritative parenting: Synthesizing nurturance and discipline for optimal child development (pp. 35-38). Washington, DC: American Psychological Association. Snyder, J., Low, S., Bullard, L., Schrepferman, L., Wachlarowicz, M., Marvin, C., & Reed, A. (2013). Effective parenting practices: Social interaction learning theory and the role of emotion coaching and mindfulness.